A weekly round up on what’s happening and what we’re seeing at the TV News Archive by Katie Dahl and Nancy Watzman. Additional research by Robin Chin. The Internet Archive’s Wayback Machine has preserved President Donald Trump’s deleted tweets praising failed GOP Alabama U.S. Senate candidate Luther Strange following his defeat by Roy Moore on September 26. So does the Pulitzer Prize-winning investigative journalism site ProPublica, through its Politwoops project. 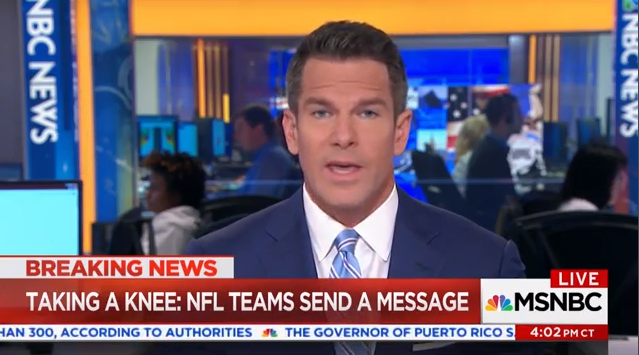 The story of Trump’s deleted tweets about Strange was reported far and wide, including this segment on MSNBC’s “Deadline Whitehouse” that aired on September 27. Experts were split over how much enforcement power courts have in the arena of presidential record-keeping, though most seemed to agree the president has the upper hand. That said, many of the experts we spoke to are closely monitoring how the court responds to the litigation around Trump administration record-keeping. He also provides background on that litigation, a lawsuit brought by Citizens for Responsibility and Ethics in Washington. The case is broadly about requirements for preserving presidential records, and a previous set of deleted presidential tweets is a part of it. 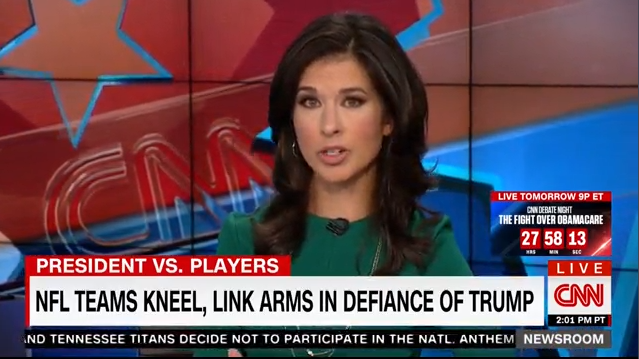 How did different cable TV news networks cover the NFL protests? 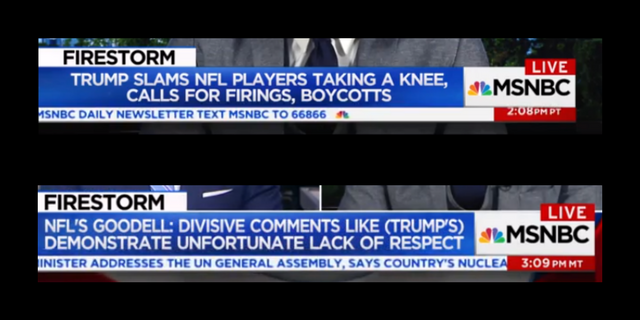 We first used the Television Explorer tool to see where there was a spike in the use of the word “NFL” near the word “Trump.” It looked like Sunday showed the most use of these words. After a closer look, we saw MSNBC, Fox News, and CNN all showed highest mentions of these terms around 2 pm Pacific. Then we downloaded data from the new Third Eye project, which turns TV News chyrons into data, filtering for that date and hour. 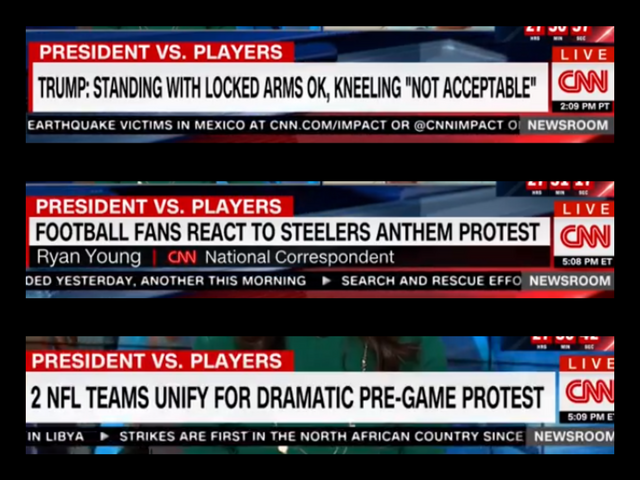 We were able to see how the three cable news networks were summarizing the news at that particular point in time. While Puerto Rico suffers after Hurricane Maria, much of the U.S. media (FiveThirtyEight not excepted) has been occupied with other things: a health care bill that failed to pass, a primary election in Alabama, and a spat between the president and sports players, just to name a few. 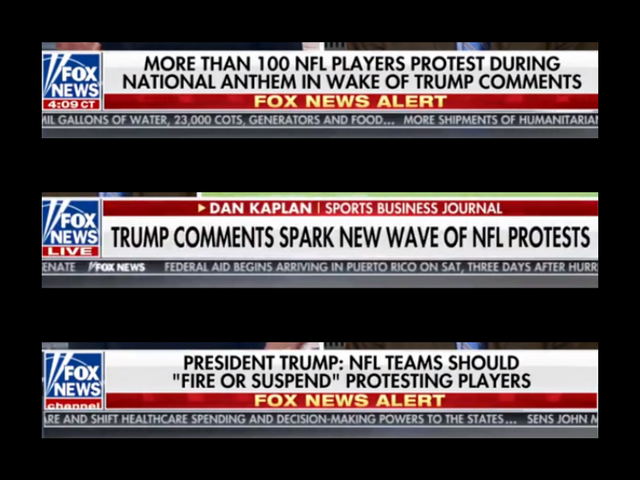 Last Sunday alone, after President Trump’s tweets about the NFL, the phrase “national anthem” was said in more sentences on TV news than “Puerto Rico” and “Hurricane Maria” combined. This entry was posted in Announcements, News, Television Archive and tagged Antarctica, CREW, Donald Trump, Luther Strange, NFL, PolitiFact, Roy Moore, Television Explorer, Third Eye, Wayback Machine. Bookmark the permalink.